Help us Spread the Email Marketing Word! 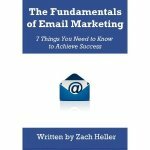 A few weeks back, I was shocked to find out that my book, The Fundamentals of Email Marketing, was nominated for a 2012 Small Business Book Award in the category of marketing. Needless to say, I was more than excited. Today, I’m asking my readers to vote, and help me take the title of best small business marketing book of 2012. To vote, visit my book’s page on Small Business Trends’ website. I’m up against some stiff competition, and I’m already running in about 16th place, so I need your help to move up the list!